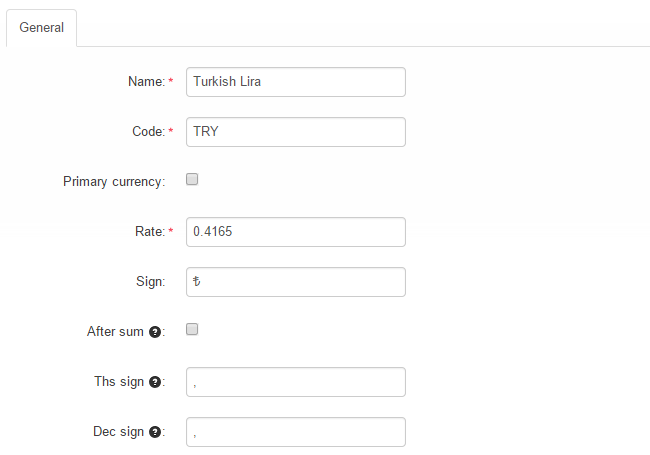 This tutorial will review the process of managing the currencies on your CS-Cart website. This is an important aspect of your website's configuration as it will allow your customers to compare the price of your products easily, using the currency they prefer. By default, no matter what currency your client selects, s/he will be changed using the default currency set for your website. However, if your payment gateway is configured to accept alternative currency, the customers that use this gateway will be changed using it, instead of the default one, set for your store. To create a new currency on your website, you first need to log in as administrator. Click on the Administration button at the top-menu and then Currencies. The system will list all of the available currencies on your website at the moment. To create a new one, click on the Add Currency button at the top-right corner of the screen. Click on the Save button once you fill in the details of the new currency. The system will automatically create it for you. If you wish to edit or delete any of the currencies on your website, you need to access the Currency manager again. The system will display a list of the available currencies on your website. Next to each one of them, there is a settings button, which will provide an Edit and Delete options for the currency.